Special Spring Offer: Buy one and get one free! Order any gold ring and get a silver ring free! Click here for full details of this exciting offer. Heraldica's Ring #1A for Stenov as described in in Rietstap's Armorial General. This ring is shown with a black onyx stone, but you may also order it with any of the following stones: black onyx, green onyx, blue onyx, carnelian, bloodstone, bicolor agate. Three week delivery! Full money back guarantee. See our FAQ for details. We can engrave your crest on your own ring! See the FAQ page for details. Your ring comes in a beautiful presentation case and with a wax impression at no extra charge. 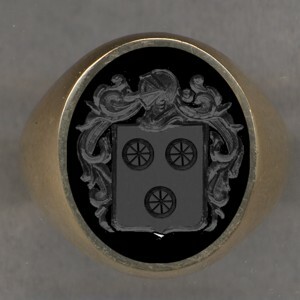 Although this ring is intended to be hand engraved with your own family crest, it may also be engraved with any other emblem or design you may send us. Any questions? Please call us at 1-800-782-0933 or +1 212 719 4204. You may also fax us at +1 212 719 4369. Copyright © 2019 Heraldica Imports Inc. All rights reserved.